Only merchants with the best experiences can earn the high ratings required to proudly display the Elite™ seal. That's how ResellerRatings Elite™ helps you select the best stores for your on-line shopping. Elite™ Our Elite Program recognizes excellence in customer satisfaction. To display the ResellerRatings Elite badge, companies must meet stringent ratings standards, and they must subscribe to the ResellerRatings Merchant Member program to actively participate in resolving customer issues at ResellerRatings. 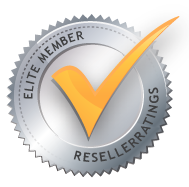 ResellerRatings Elite™ stores are the best, safest places to shop online. Are you a merchant, brand or service? Learn how you can maximize your greatest asset - your satisfied customers - with the Elite™ seal and merchant tools.